What is Art Deco style, can you all tell? Well, its a style of decorating your home on extremely gorgeous and luxurious lines. This style of interior decor was in vogue in the 20’s and 30’s and featured eclectic geometric patterns, bold color schemes, velvet undertones and silken fabrics. In this style of decor, houses usually boast of expensive antiquities, unusual furniture and motifs drawing inspirations from Egypt and France. 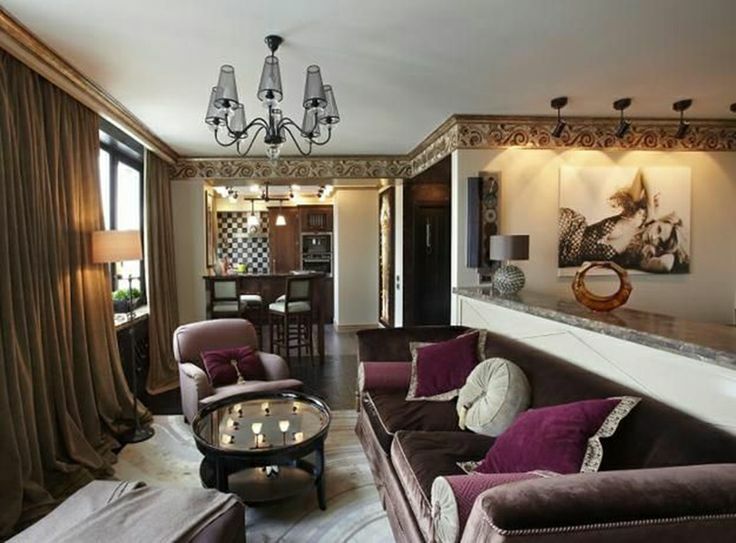 One can also spot generous usage of animal prints and floral textures in an Art Deco home. Today, we will be presenting you with a mind blowing collection of 37 Art Deco living room ideas that will charm you to no limits! 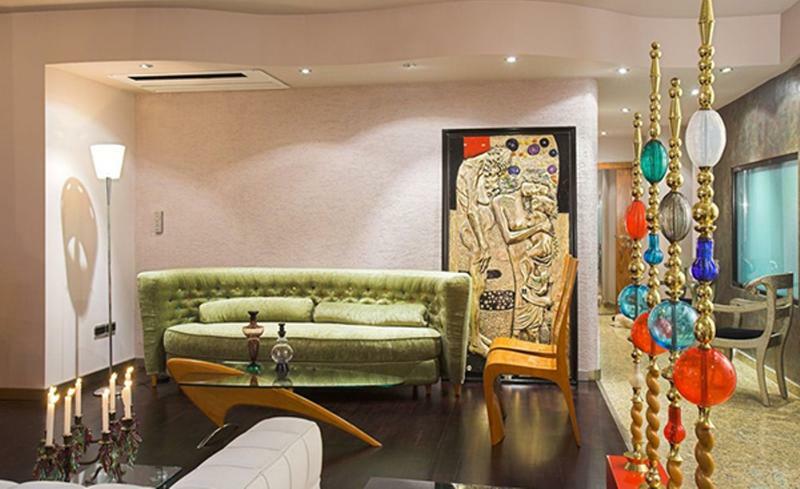 What is the one peculiar aspect of a decor associated with Art Deco, can you all guess? Well, its animal prints! Its a very stylish element to be introduced if you want to add a glam touch to your interior’s decor. Animal prints are commonly used in interiors inspired by Art Deco. In this living room above, the designer has enhanced the beauty of the decor by choosing two stylish looking animal printed chairs that integrate perfectly with beige color palette incorporated all over. If you look at the contours of this room, you will find that the designer has used lots of grays and beige to decorate the interiors. Along with this color scheme of neutrals, there is one striking feature used to stylize this room’s decor – the colorful wall piece seen on the wall behind the sofa. This is the only piece in the entire living area that bursts with pops of vivid colors, thereby, making the whole decor lively and fun. A funky Art Deco interior design is seen in this stunning living room. The choice of fabrics and the color palette is sophisticated, and integrate nicely with the rest of the textures. The whole atmosphere of the room looks lively and bright, courtesy, the pots, cushion and the lampshade. The color scheme working dominantly in this decor is pastel, but it’s monotony is broken down by the black horse showpiece placed on the wooden table. All the accents used in this room are with precision. What a glam looking decor! This living room looks like its an abode of a Hollywood star with an accent wall decked up with picture frames of old Hollywood actors and actresses. The whole ambiance looks warm with eclectic wooden Art Deco inspired furniture. The other striking feature that grabs your attention is the textured or patterned wood over the fireplace. 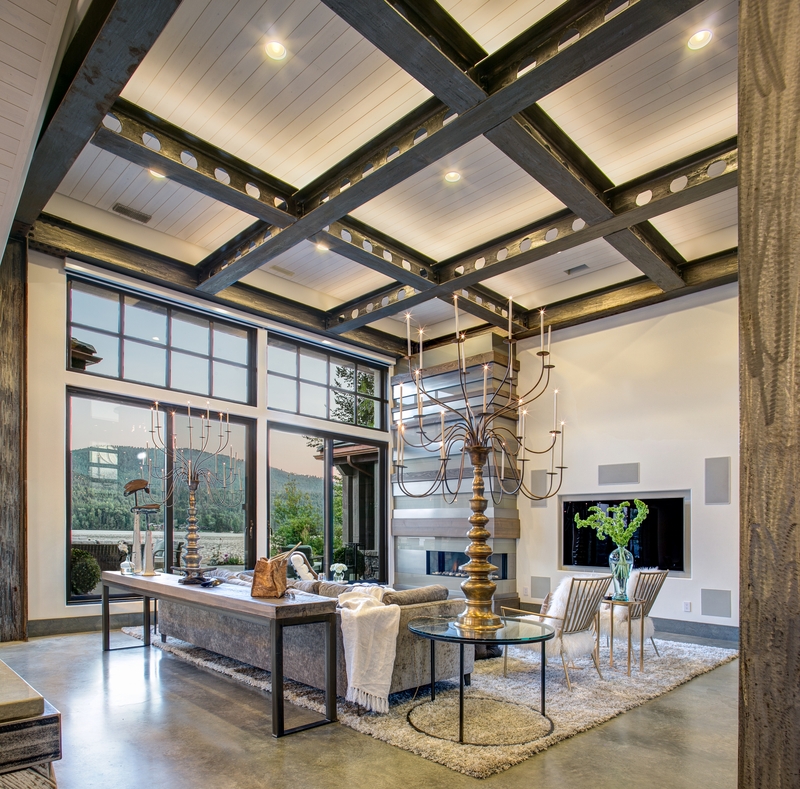 The wooden elements merge beautifully with the greens used in this room. Featured in Vogue, this room appeals with its sudden bursts of yellow color that spread freshness all around. The yellow accented accessories offer a striking contrast with the white, beige and wooden tones seen decking up the area. Another noteworthy aspect of this charming room is its African themed painting. African themed accessories are an integral part of an Art Deco styled house and lend a whimsical touch, just like the baby cheetahs painting on the wall in the image above. The painting is bordered by a colorful pattern and looks quite stylish. 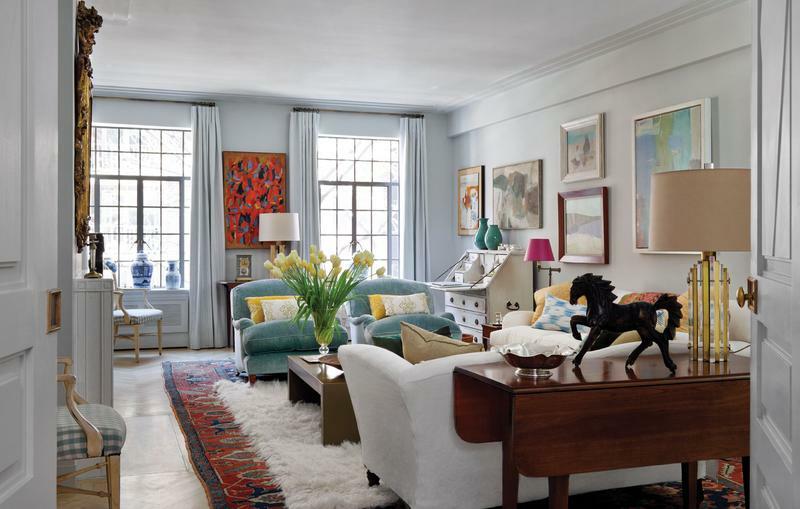 In this living room, the decorator has used turquoise and white color scheme to bring freshness to the decor. The merging between the pure white and the fresh turquoise helps in creating a bright spot. The geometric patterned rug in turquoise and the chandelier contrast nicely with the white walls, curtains and the furniture. These two color schemes create an elegant setting for this whole room. If you think you have seen it all, then you are highly mistaken! This living room is an epitome of elegance coupled with glamour and sass. 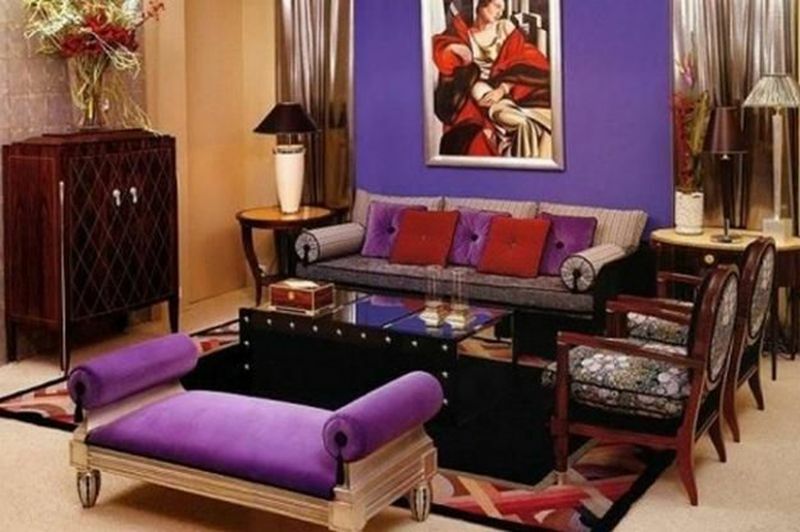 The deep purple tones seen here are reflective of the modern Art Deco style of interior designing. The rich purple color is splashed in the cushions embellishing the velvety sofas. 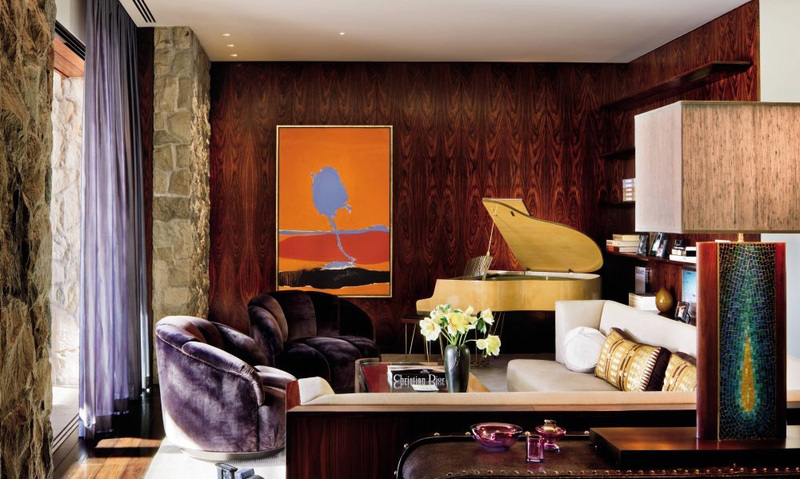 Purple blends nicely with the furniture of this room, and also the brown panels that look ornamental. The first thing that comes to your mind when looking at this living room is funkiness. The decor is beautified with the help of French furnishings and stunning antiquities like the artwork seen decking up the wall above the fireplace. More French elements are included to give it a dazzling touch, like the rug with striped patterns, the sectional sofa with curves and the typical French pendant chandelier. Shown above is a stunning Art Deco style living room that has been designed with sophisticated accessories and furniture. The sofas are typical Art Deco in style and design, while there are geometric textures used all around. For example, the pillows featuring black and white geometric designs and the picture frames hanging on the walls. A visually interesting living room can be seen above. Its been decorated on Art Deco lines and features an unusual color combo of yellow and dark. The room becomes attractive with its silken yellow colored pillows thrown on the geometric pattered couch. These pillows match the gray tone of the velvety chair and the area rug. 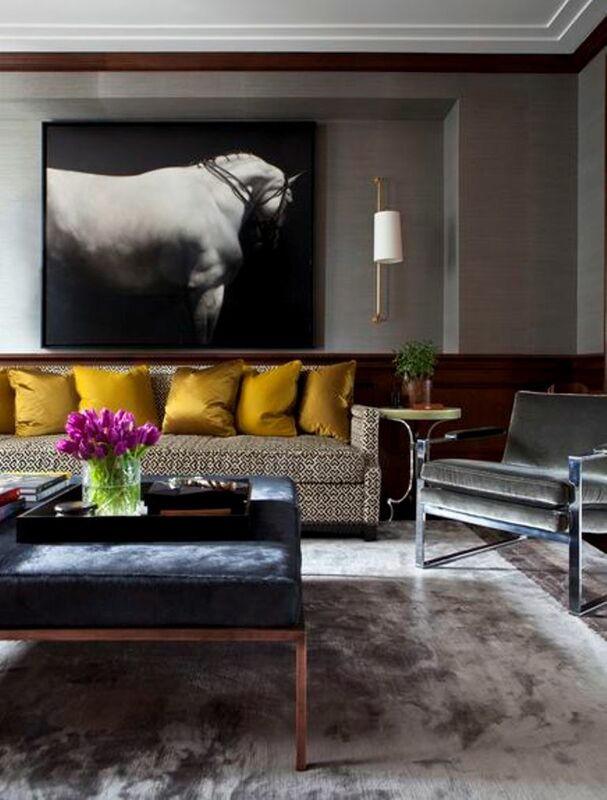 The huge horse portrait can be seen embellishing the wall and offers a striking contrast with the yellow silken pillows. Each angle of the room looks dramatic. Any home with an Art Deco themed interior has to feature rich textures, silken fabrics, extravagant accessories and bold geometric patterns. The modern living room seen in the image above looks every bit Art Deco as it features an expensive display of stylish accessories and boasts of rich furnishings. The wooden cabinet with a large mirror offers a striking variation with the white color scheme used throughout the room. The white themed furniture like the cushy sofas and the white bar chairs look extremely sassy. The facade of the white doors bear intricate geometrical designs and look visually appealing. The use of flower candles and lampshades create a warm ambiance in this room. The beauty of Art Deco home accessories is that they can blend well with most other elements in every kind of decor. From geometric patterned textures to flower vases, to books, an Art Deco inspired room will feature many sorts of eclectic things to bring the vibes of the 30’s and the 40’s. Seen here is a living room that attracts everyone with its bold geometric artwork plastered on the wall. This roundel art-piece becomes the focal point of the room and it blends perfectly with the metallic golden hanging lampshades. The walls are grey and have linear patterns that become a gorgeous backdrop for the round art-piece. The whole decor is dominated by horizontal and vertical lines that lend an elegant feel to the room’s atmosphere. An all white color palette works wonders for an Art Deco inspired room. When you look at the living room above, you just cannot help but drop your jaws in awe! Its so spectacularly decorated using all kinds of Art Deco elements that are blending just right with one another. The ceiling of this room is gloss finished and reflects the decor in a visually interesting manner. The geometrical wall art too looks classy and makes the interior sophisticated. A classic example of a chic Art Deco styled living room can be seen in the image above. The most eye grabbing feature of this room is of course the velvety green sofa that offers a silken touch to the whole decor. Placed right besides it is a big Art Deco painting that accentuates the beauty of this whole room. The chairs in wood look stylish. To complement the beauty of the soft color scheme, the designer has used golden accented ornate rods with glass beads. This stylish abode looks Venetian inspired and is modern in its choice of textures, colors, and craftsmanship. The living room looks dressy with a luxurious backdrop of a wall textured with geometric patterns. It looks as if its tufted. One can not help but notice the chic carpet featuring the Aubusson Deco of the 1920’s and the glamorous lamps. The whole ambiance transposes you to the decadent era of the 1920’s. Boldness of furnishings define this stunning Art Deco living room where every element surpasses the other. Be it the maroon red textured gliding curtains that are seen draping the ornately designed window, or the red patterned couch that looks every bit luxurious, the room’s decor captures you with its opulent styling. Matching with the red accents are the metallic tones seen used in the decoration of this room. For example, the golden ornate holders and the lavish lampshade in gold and black patterns. The use of tassels and flowers help in enhancing the glam look of this room. The living room here manages to transpose us to the eras of the 20’s and the 30’s with its choice of colors and use of accessories. The dark tones seen on the painting, the pillows, the foot rester and the chandelier contrast beautifully with the softer white accented walls and ceiling. The designer has skillfully managed to recreate the look of the 20’s with the help of chic furniture and the drapery in greenish tones. What will be your likely reaction when you enter this gorgeously styled living room? Our guess is that your jaws will simply drop! One can see a blend of many accessories here, but, the one feature that grabs you by surprise is the ceramic wall art pitched right behind the velvety red sofa. The wall art is handmade and is graffito carved. The colorful wall art blends seamlessly into the decor’s white color palette. The designer has also placed a wooden piano to bring back the feel of the 20’s. This living room features a stunning Art Deco interior that is predominantly black in texture. The most striking feature that takes you by surprise is the use of geometry in the wall design. The black walls of this room are painted with white hexagonal patterns in a synchronized way. To match with these walls, the designer has chosen black sofas and styled them up with white framed paintings. The rug on the floor too features black and white patterns and teams elegantly with the white side table and the gorgeous modern lamps. Want to relive the golden era of the 30’s? Then, think not and try this glam decor idea today. This idea will let you play freely with golden tints where you can pick the choicest of accessories and team them up with expensive silken fabrics and furnishings. 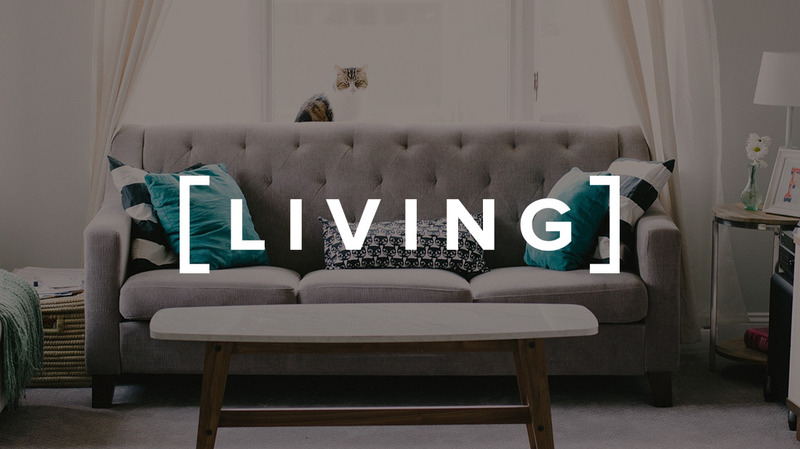 The living room here celebrates the 30′ in a very fabulous way. The designer has decorated the wall with beige color and enhanced its appeal by hanging a sunburst mirror in gold tones. The silken fabrics used on the sofa add a certain uniqueness to the way the room appears. Matching with the golden tones are the silver lamps placed on both sides of the sofa. The ambiance of this living area seems to transport you to the glamorous eras of the 20’s, 30’s, and the 40’s. The aspect that works wonders to recreate the look of those times is the choice of color scheme – muted pink. The designer has used muted or subdued pink to weave magic to the decor. The pastel themed armchairs look stylish and match well with the white couch and other white accessories arranged everywhere. The unusually crafted furniture of this room lends a bit of whimsical feel to its decor. The decorator has combined this feature well with other elements like the concave crown molded ceiling and an Art Deco inspired fireplace with an ornate iron embellishment. The decor looks ravishing yet simple and makes you go back in time. Come and relive the golden times of the 30’s and the 40’s with this magnificent example of Art Deco interior seen above. The room has been adorned with loads of brown accents that work well with the reds. The entire decor is based on geometrical shapes. One can spot rectilinear and curvilinear designs in the roofing as well as in the entrance of the compact dining nook nestled coyly in one corner. Featuring Egyptian and Neo Classical tones, this living room is grand in every possible way. The decorator has used an aesthetic combo of silken furnishings and animal prints that merge perfectly with the rest of the accessories in the room. Some other features that look awe inspiring are the period showpiece, the lampshades and the Egyptian pleated curtains draping the windows. The pleats mimic buds of a lotus flower, and this is one component that is usually associated with most Egyptian artworks. Working in perfect harmony are the Neo Classical black rods designed with god leaf finials. Expensive light fixtures are an integral part of every Art Deco inspired interior style. Any room that lacks a gorgeous chandelier fixture will not be able to emulate the style of the 20′ and the 30’s era. The living room here comes alive and stimulates your senses with its majestic black silver accented chandelier that hangs right at the center of the room. It makes the decor dazzle and appear bright. This brown and golden styled living room is a stunner. It has been designed, keeping in view the opulent Art Deco style of interior designing, and features expensive accessories and fixtures. Most striking is the golden metallic toned sofa that merges elegantly with the brown rug and the wall. Adding another dimension to the whole decor are the two glorious looking transparent chandeliers. This warm and cozy living room boasts of multiple Art Deco inspired accessories and textures. The bold and rich wall color enthralls everyone with its exquisite textures and blends in easily with the velvety sofas in purple tones. These sofas are in perfect symphony with the curtains draped over the window. An Art Deco interior design will always feature bold geometric patterns and textures that speak only of opulence and grandeur. The living room above has been styled with a Mid Century rug featuring geometric designs and integrates well with the colorful geometric patterned seater. One peculiar feature seen here is the use of squares in most of the elements in the decor. These squares gel well with the other furniture that bear roundel shapes, the picture frames and the floral vase. This opulently designed living room is quite luxurious in appearance. The designer has used massive sized golden candelabras with sleek candles illuminating soft light. These golden candelabras are not the only feature to grab your attention. If you look closely at the interiors, you will find that the majority of accessories are based on geometrical themes, such as the round glass tables, the console rectangular table, and the square shaped wooden ceiling panels. An artistic way to dress up your living room is to use bold textures, and geometric patterns. The room here has a Mid Century feel to it, thanks to the furniture used here. The two wooden sofas look extremely artistic. The most appealing feature here of course is the zig zag patterned geometric rug. The other accessories like the painting, the lamps, the poodles and the sunburst mirror are typically Art Deco in style. Opulence is splattered all over this living room in the form of gorgeous red toned sofas and the twin wooden center tables that are Art Deco in style. This red furniture choice works seamlessly with the black and white geometric walls that look very artistic. The mirror above the fireplace looks massive and reflects the crystal chandelier in a stunning way. This monochrome color scheme is broken down by an attractive zebra printed rug that becomes the highlighted feature of this room. The other two shades that weave magic here are white and turquoise. The furniture in white looks stylish against the rug that becomes the ultimate accessory to break away the monotony and creates a striking look. This Art Deco living room furniture is eclectic and features a sofa with a colorful patchwork that lends warmth to the whole room. Complementing its look are the two chairs that are designed on industrial lines. The bold colors of blue and orange lend vibrancy to the interior and make it inviting. 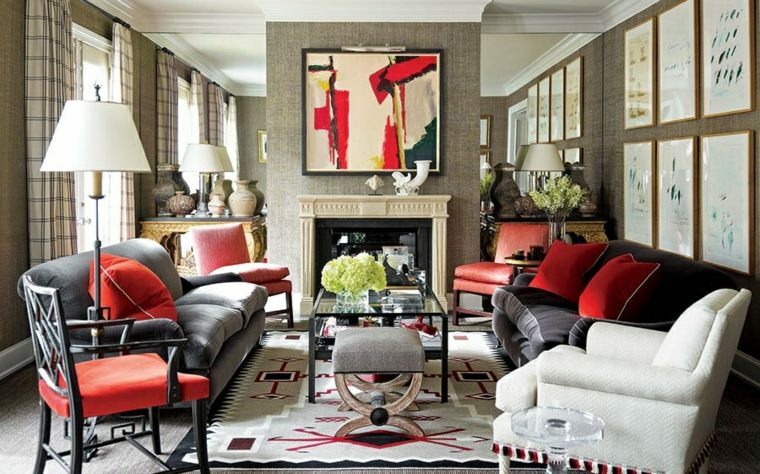 Here is an attractive Art Deco living room that features lots of different colors and designs. 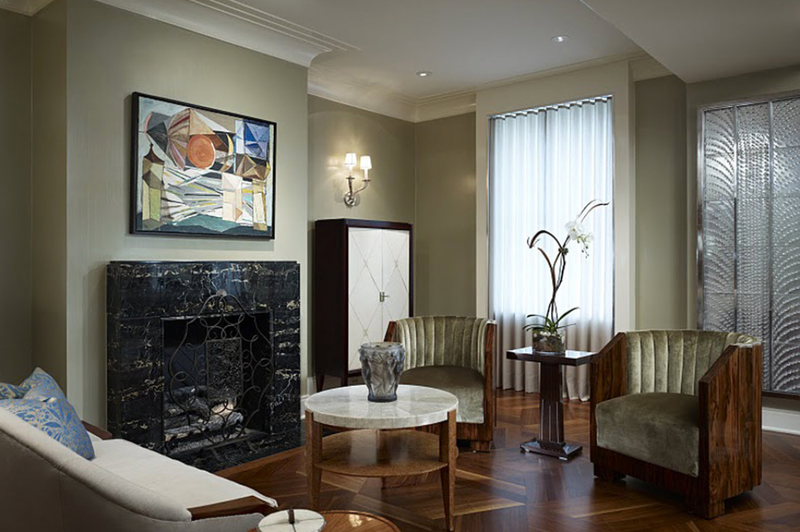 The wall painting above the fireplace helps in defining the Art Deco style in detail and steals the limelight. Complementing it are the gorgeous grey sofas with throw pillows in red. Other colors work in tandem with the red and include baby pink, and white. While the modern painting is a show stopper in this room, the floor carpet in geometric patterns is no less in attracting attention. The golden accents work majestically in Art Deco styled interiors. Here too, you will be able to spot golden tones in the two massive chandeliers that look opulent and every bit luxurious. The roundel three layered golden chandeliers with crystals merge well with the cream tufted chairs, the white pillars with floral vases and the paintings hung above the fireplace. The sparkling chandeliers are installed at the center of the room, thereby, illuminating it from all quarters. The purple accented Art Deco style living room in the image above will suit such homeowners that like their interiors with a bit of funk. The dominant color scheme to work wonders here is purple. You can see that the designer has placed a purple toned bench with side arms and has matched it with the purple accented wall. The other sofa is dressed up with throw pillows in red and purple again. The contrasting effect can be seen when the red and purple shades mix and merge together to create an eclectic feel. Spectacularly decorated, this living room is an epitome of beauty and class. In this room, you can see two colors – beige and black working in a synchronized manner. While, the walls, curtains, and sofas are in beige, the television table, the lampshade and the recliner are black. The furniture is tufted and is furnished with rich silken upholstery. The vertical stripped beige wall behind the sofa is styled with ornate frames. All Art Deco home accessories that you have seen today are downright expensive and are perfect epitomes of luxury and opulence. Art Deco style of designing celebrates richness of patterns and boldness of textures that are unparalleled by the other styles of decor. Be sure to check these fascinating and creative Art Deco living room ideas in detail and pick your favorite.